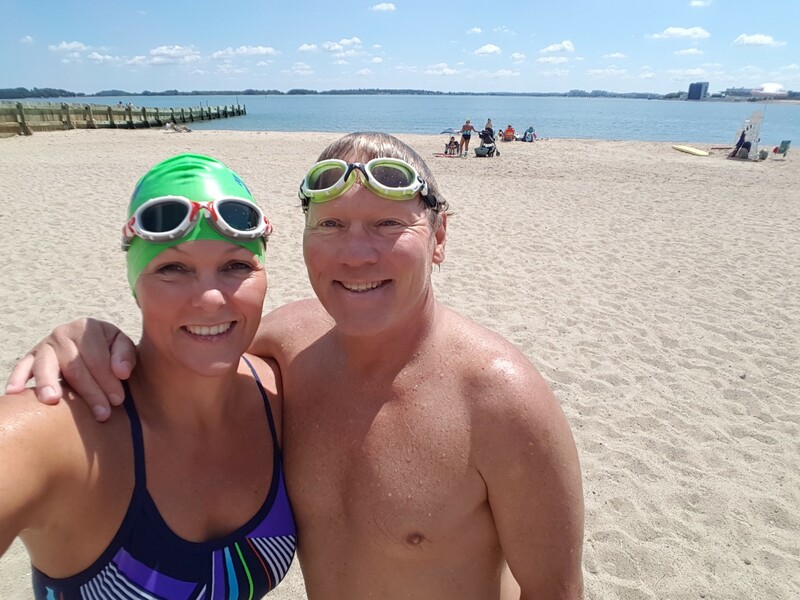 When Roger had saved and secured my Manhattan Island circumnavigation swim with New York Open Water and the new 20 Bridges swim (thank you again David Barra, Rondi Davies and Alex Arevelo), he realised the Boston Light Swim in Boston was only 5 days later. Roger had met Greg O’Connor (who runs the swim alongside Elaine Kornbau Howley) at SCAR in Arizona in 2013. This swim, although not his usual Channel or Strait crossing distance, was one he had wanted to enter for some years. …and this is how our swim plans come together! 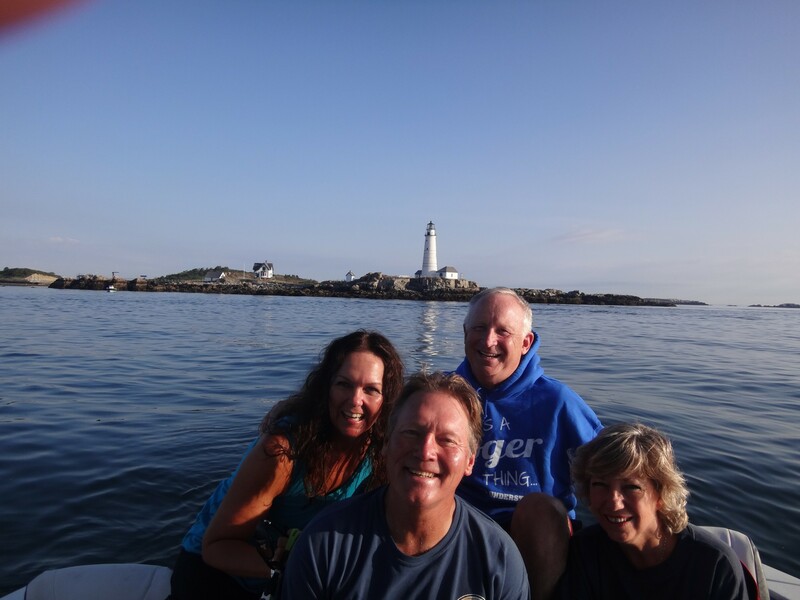 As Roger was crewing for my 20 Bridges swim, I wanted to return the favour and crew for his Boston Light swim with pleasure! Jim Clifford who was also driving up to crew for my Manhattan swim, said he would fly to Boston to crew for Roger too. A plan was born! However, on the 11th of July, our carefully laid plans were in grave jeopardy, and so was Roger’s health – exactly one month before we were to fly to New York. Roger was flying to Cape Town and took ill on the plane. He was very disorientated and coming across confused. Thank goodness fellow English Channel swimmer and his dear friend Mark de Klerk was on hand to help Roger out. Mark took him from the airport straight to the hospital where Dr Otto Thaning is a heart surgeon (and of course another English Channel swimmer and dear friend). After a lot of tests it became evident that Roger had suffered a small stroke. When I received the messages that something was wrong and what was suspected – my first thoughts were the obvious what ifs!! What if Roger was left with long lasting physical difficulties. Or there was long lasting mental impairments? Anyone who knows Roger, knows he’s a larger than life character and a lover of life. To take that away from him, would be like taking away a limb. I was beyond worried for my dear friend! The great news was, the medical team looking after him found the problem within hours. Damage was minimal. We could all worry a little less. Now the team of experts overseen by our dear Otto, had to find out ‘why’! As soon as I talked to Roger he said “don’t worry, whatever happens, I will still be there to crew for your Manhattan Island swim”. I had HUGE doubts that he would be which was of course the last thing I was worried about! I just wanted my friend to be more than ok and get back to the Roger we know and love! Well, he defied everyone and our plans to do our swims and crew for each other, went full steam ahead. Roger was given the all clear to travel and swim. At the same time, he was also told to listen to his body and rest when necessary and not to overdo things. His training for the next month amounted to maybe 5 gentle training swims! 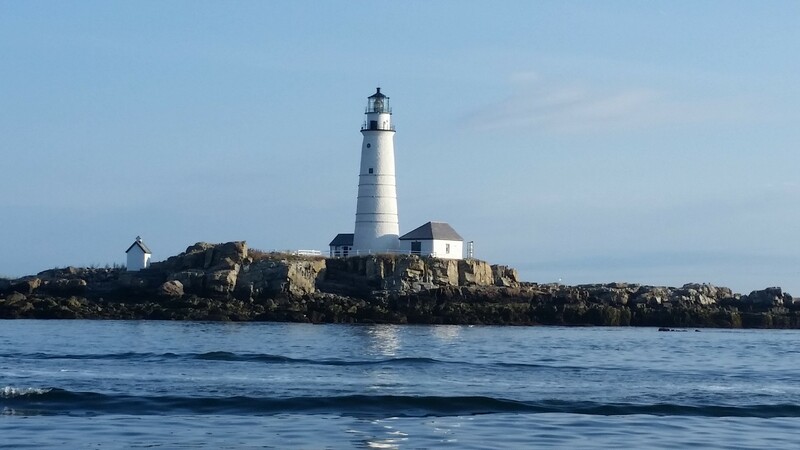 His Boston Light swim would be 100% reliant on muscle memory, experience and his usual grit and determination! 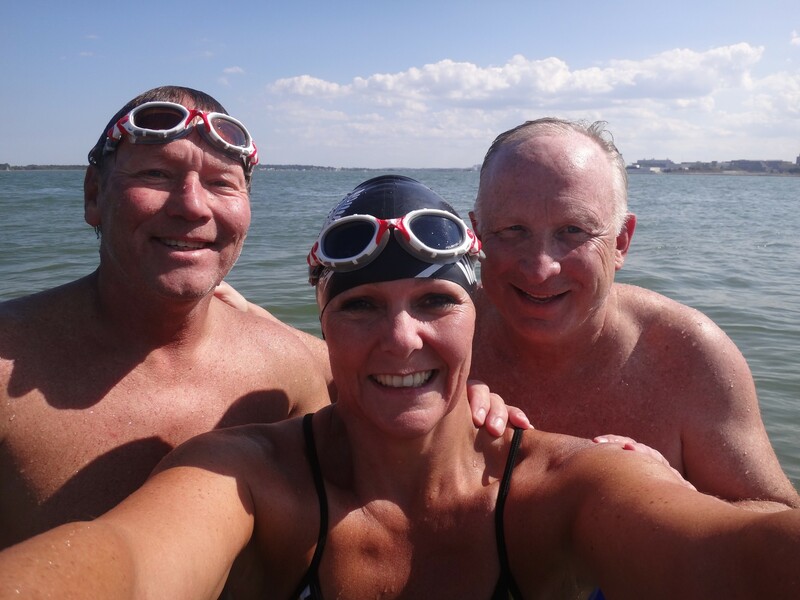 I have already written about my Manhattan Island swim and how Roger, Lindsay and Jim were there for me in every way. Now it was my turn to be there for Roger. Two days later, I drove us to Boston. I could tell he was very nervous. To anyone else he was the jovial, happy go lucky Roger…! 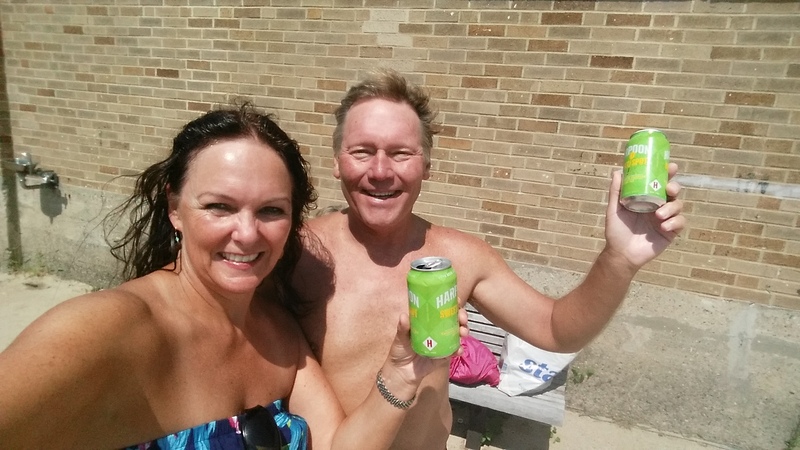 We went for a few swims in the infamous L Street Beach on the Thursday and the Friday leading up to the swim which I know put Roger at ease. Jim joined us for Friday’s swim – our Orion’s Belt trio was back together again. 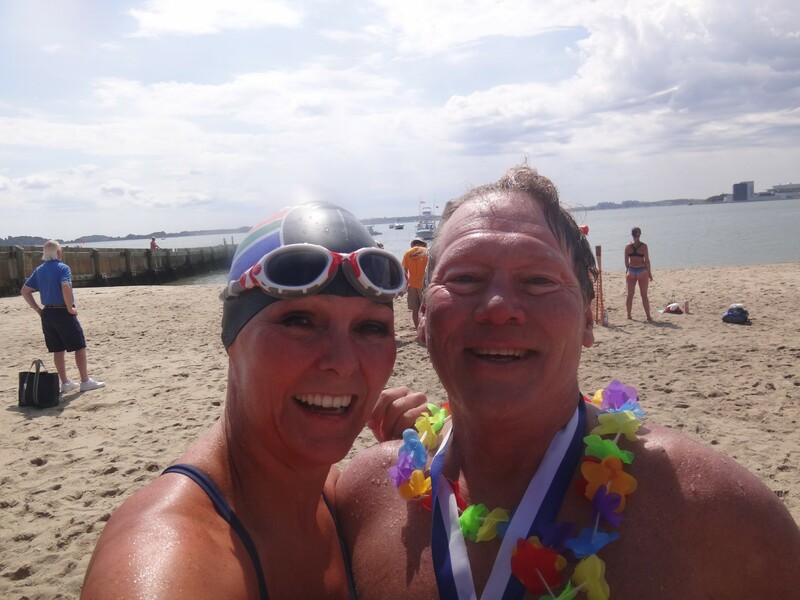 From the English Channel for Jim’s successful solo in September 2015, to my successful Manhattan Island swim a few days earlier, and now together again for Roger’s Boston Light swim (which Jim had swum (and won the men’s category) the year before). Afterwards there was a briefing given by organisers Greg and Elaine and a dinner for swimmers, boat pilots and crew. 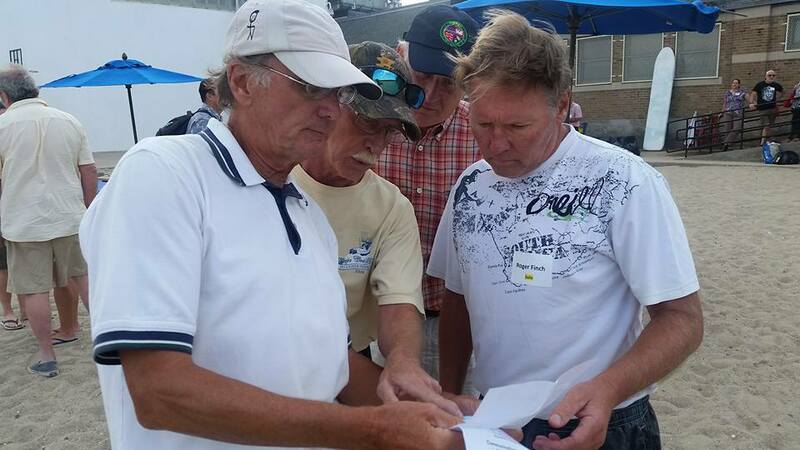 We met our great boat pilots Captain Jim and Tom who immediately instilled confidence in all of us. The next morning we met down at the marina as the sun was coming up. It was going to be a stunning day! Better weather couldn’t have come at a better time. The last thing Roger needed was a rough and unforgiving sea today! We were also informed as we cruised across to the beginning of the swim, that there was a strong current in favour of the swimmers. More good news! We approached the Boston Lighthouse, which interestingly is the oldest lighthouse in America and 2016 was it’s 300th anniversary. The setting was beautiful. I greased Roger up and said to him “listen to me. Today is not about pushing yourself. Today is about getting in there and just enjoying your swim”. I could feel his nerves. 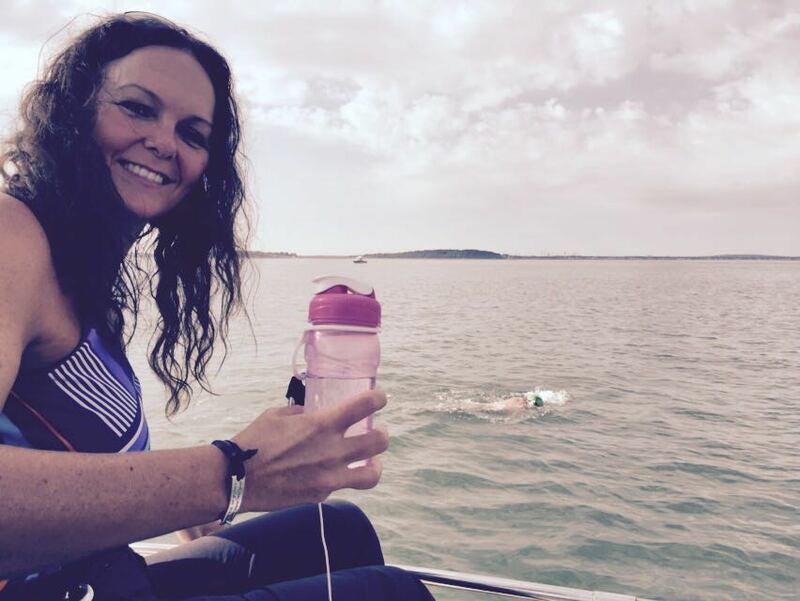 It didn’t matter that this swim was ‘only 13 kilometres’ – it may well have been another Channel swim after what had happened a month earlier! The siren sounded and all the swimmers jumped overboard and started to swim. Jim and I moved up to the front of the boat to watch over our friend while Lindsay watched quietly over her husband from the back. All three of us keeping a close eye on any changes in stroke or breathing. Jim also wore his “It’s a Roger Thing, You Wouldn’t Understand” sweatshirt for added support! After about half an hour Roger really settled down into a good and relaxed rhythm. He was smiling up at us. I was throwing out his feeds to him on a diving reel. One hour into the swim I put some fruit into a container along with his drink. He picked out a piece of banana and threw it at me and got me on the leg! Not the smartest thing to do on a swim and normally I would tell him off! Today was different though. This showed he was relaxed and happy and enjoying himself and I was so relieved to know this. Time went by really quickly and within a couple of hours we could see the Boston skyline. Greg (the organiser) was fully informed of Roger’s earlier health scare and had agreed that Roger could still swim, so long as I swam him in. Jim and I could see Roger was hurting and of course had tired arms due to his lack of training. As I said earlier, we knew it would be his experience and determination that would get him through – and he was proving us right! Finally Captain Jim said it was time for me to get ready to jump in to swim him in. I already had my togs (cossie) on, I put on my South African swim cap and goggles and jumped in the water with tears in my eyes. I remember that first breath I took to the left and Roger was breathing to the right! We both smiled at each other – no words were needed. I (again) had tears in my goggles. I kept breathing to the left and swam in rhythm with Roger, both of us still smiling! We finally ran out of water to swim and both stood up. I got out Roger’s waterproof camera and started videoing him. To my horror he stumbled and fell. I made myself hold back – if I ran to him and helped him he would be disqualified! He got up, took a few steps and then fell again! I said to him “Roger, are you ok” he turned to me and smiled so hard – I knew he was just fine! We exited the water and Roger walked over the finish line. I had more tears….and so did he. Roger is still the only South African to have completed the Triple Crown of open water swimming. 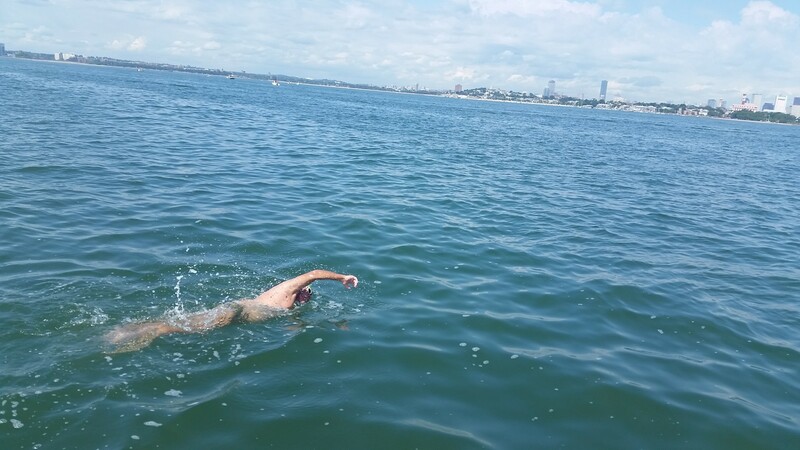 I have no doubt that completing his Boston Light swim means more than all three of those swims put together. I have never been so proud to see someone complete a swim and not only did he complete it, he came 11th out of 24 solo swimmers in a speedy time of 3 hours 16 minutes and 24 seconds! The organisation, camaraderie and atmosphere of this swim is like no other I have experienced. Greg and Elaine, also incredible marathon swimmers themselves, organise this swim fantastically. They even have a brewery as a sponsor! Swimmers head over to the L Street Tavern once all swimmers have finished. Not only does this tavern have Guinness on tap, it was the local bar featured in Good Will Hunting! 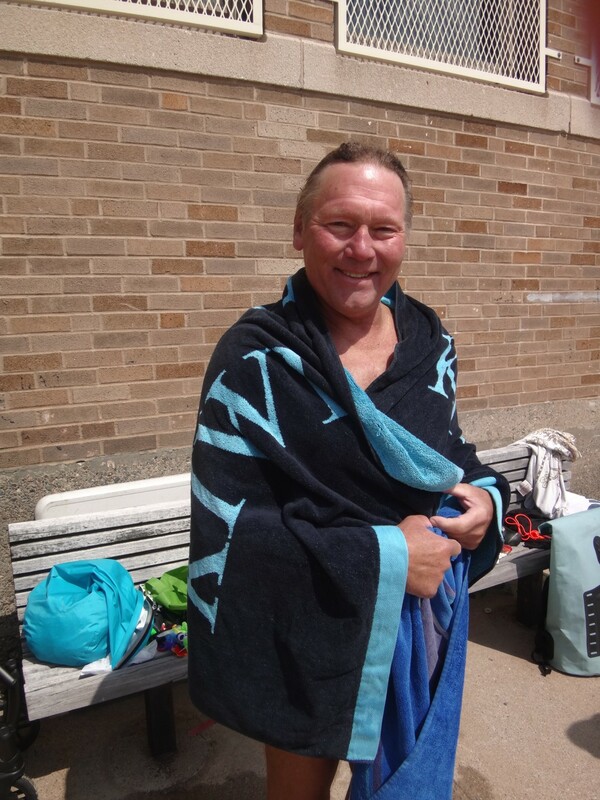 A great end to a great swim and such a meaningful accomplishment. Well done my dear friend. You have done so much for so many swimmers around the world, and especially for me! To be there for you during this more than scary time and this beautiful and important swim – will always be with me. Here’s to many, many more swim camps, crewing and swim adventures!